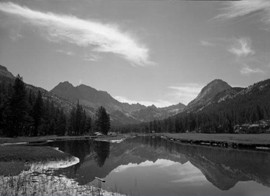 McClure Meadow, Evolution Valley, King's Canyon National Park, California, 1951 by Philip Hyde. "The Evolution Country" was one of Philip Hyde's all-time favorite places to backpack. This interview republished by permission of the writer Gary Braasch and Bill Kemsley, Jr., founder of Backpacker Magazine. BACKPACKER MAGAZINE: You have not only made your creativity into a successful way of life but taken photographs that have been instrumental in battles for very important wilderness areas. How can other photographers—skilled amateurs—use their creativity for conservation? PHILIP HYDE: Off the top of my head, they’d do a lot better by going to law school because it looks to me as if the fight is now in lawyer’s hands. But on a local level, an individual can do a lot by becoming familiar with a place that needs protection and by studying the issues. The camera can be an important tool to him. The person can make himself an ad hoc committee on a project and carry it along until something gets done. The weekend photographer may have an even more important role in such cases than the professional, who is always hung up on having to make a living from photography. There are thousands of causes I could donate my photographs to if I were only privately endowed. BACKPACKER MAGAZINE: How did your career evolve? 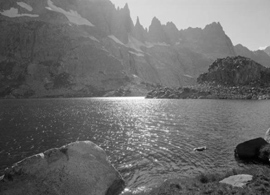 PHILIP HYDE: I started in photography through nature, rather than vice versa, because of an early interest in mountains. Like everyone else, I carried a little camera around to take pictures of my favorite mountains, and one thing led to another. That was before World War II. When the war ended, just before I got out of the service, I wrote to Ansel Adams. He said he was starting a school of photography; that’s where I spent the next three years. Ansel knew I was interested in conservation and nature, and helped me get acquainted with people in the Sierra Club. My first major published photos were in the Sierra Club Bulletin of May, 1951. Making photographs of Dinosaur National Monument was the first conservation project I did for the Sierra Club. Even with that beginning my wife, Ardis, taught school for 12 years to support us. BACKPACKER MAGAZINE: There’s a lot of Ansel’s influence showing in your earlier work. PHILIP HYDE: Yes, some people have always said that. But I don’t think I ever imitated him. That picture of Yosemite is a good example of my evolution. Twenty years ago, I had great difficulty making photographs in Yosemite because all I could see was Ansel Adams, and I was sure I didn’t want to duplicate his pictures. Now I can go to Yosemite and see it through my own eyes. I have a tremendous debt to Ansel—not just for having taught me technique but for having inspired me, introduced me to the Sierra Club and helped me get on my way. I want to acknowledge that debt, but I don’t agree that my pictures have ever been more than superficially like his pictures. BACKPACKER MAGAZINE: Let’s discuss taking photos for straight illustration to show other people what a place is like, versus an artistic, creative image done to please yourself. The difference seems apparent in comparing many of your shots in The Wild Cascades with those in Slickrock . For instance, the photographs in the first book have much less emphasis on small detail. PHILIP HYDE: Several things happened between books. One was my own development. I think I started out with the idea of showing people what an area was like. When I went there I was very conscious of it as a place. Through the years as I visited more and more places, I began to realize that the PLACE, in capitals, is not really what we’re looking for after all; PLACE has become a commercial object more than anything else. To illustrate: There is no difference between Capitol Reef National Monument and Capitol Reef National Park. The place is the same, but the name change was sponsored by Utah’s industrial tourism because the term “national park” puts the place on the map. If the current wilderness proposal goes through the way it should, a very large percentage of the park will be preserved as wilderness, and the place will remain pretty much the same. Practically every book project I’ve ever worked on has had a very strong conservation aspect for saving a place. Another difference between the two books you mentioned is not the photographer’s approach but the editing. For The Wild Cascades and The Last Redwoods I produced many of the photographs, and I certainly edited them. I didn’t just dump the takes on somebody’s desk. But working with David Brower, he pretty much decided what ended up in a book. Practically all the exhibit format books were crash projects; that was Dave’s way of working. When he got an idea, he wanted to see it in a book as fast as possible. I was sympathetic to that wish because some of the places were threatened, but it often meant that the people involved didn’t really have time to do their best work I think that shows up in the photographs as well as the texts. Slickrock is a more finished book because I took all the photographs and I worked on the project a lot longer. I worked on it for several years before I ever talked to anyone about a book. I helped with the photo selection; the design and sequence of photographs were worked out by the book’s editor and a designer. BACKPACKER MAGAZINE: It seems more and more nature photographers and editors are using images that suggest an area or give an impression of it without being specific about the exact location or subject, such as your exquisite photos of small details in Slickrock and here in Backpacker Magazine. Do you see this as a major trend in outdoor photography? What is your favorite place to hike or backpack? At the Celebration of Philip Hyde’s Life in May 2006, Pulitzer Prize winning photographer Jack Dykinga said a 1975 article in Backpacker Magazine by Gary Braasch about Philip Hyde called “Conservation Photographer” began Jack Dykinga’s journey to leave photo journalism in Chicago, move to the West and become a landscape photographer. 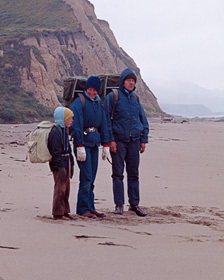 David, Ardis and Philip Hyde on Drake's Beach, Point Reyes National Seashore, California, 1972, by unknown bystander. The last photography visit to Point Reyes before the Sierra Club re-issued "Island In Time: The Point Reyes Peninsula," in 1974 in the Exhibit Format Series. The first issue was released in 1962, the same year as Eliot Porter's "In Wildness Is the Preservation of the World," and Rachel Carson's "Silent Spring." Eliot Porter's book consisted of all color photographs and Philip Hyde's book contained half color and half black and white. The second edition of "Island In Time" had more color plates including the most well-known image of Drake's Beach. "Island In Time" played a significant role in the campaign to make Point Reyes National Seashore. The Sierra Club published the second edition in 1974 to celebrate the creation of the National Seashore and announce that more funds were needed to complete the purchases that would make the final boundaries. On backpacks, Philip Hyde carried mainly photography gear and the campfire grate or cook stove, while Ardis Hyde carried most of the food and related supplies. This was about the age that David began to carry more of the food too. Hence the glum facial expression. The first issue of Backpacker Magazine came out in spring 1973, which took three years to put together. Bill Kemsley, Jr worried that America in the early 1970s did not have a backpacking community large enough to support a magazine. He wanted Backpacker Magazine to support itself through subscriptions rather than through advertising. By 1973, the Baby Boomers had taken up backpacking. “The number of new backpackers alone in that year exceeded the total number of all backpackers on the trails just four years earlier,” Bill Kemsley said in “How the 1970s Backpacking Boom Burst Upon Us” in Appalachia Magazine. The total number of backpackers between 1968 and 1973 nearly doubled in just four years to more than 15 million. It took another 24 years until 2007 for the total number of backpackers to double again to 31 million. “One of my heroes was David Brower,” Bill Kemsley, wrote recently in an e-mail. “One of the main influences for my including photo interviews in almost every issue was David Brower’s use of coffee table books for promoting the preservation of wilderness. I had lots of cooperation from nature photographers because of our mission.” The second issue of Backpacker Magazine featured Eliot Porter and the list went on: Galen Rowell, Ed Cooper and many others. Besides the Spring 1975 article on Philip Hyde, Backpacker Magazine featured Philip Hyde interviewing Ansel Adams in the June 1976 issue. You will see this article by Philip Hyde and the interview of Philip Hyde by Gary Braasch in future blog posts. Bill Kemsley, Jr sold Backpacker Magazine in 1980. It went through several owners before Active Interest Media, the current owners, bought it in 2007. Active Interest Media, based in Boulder, Colorado, also publishes Yoga Journal and American Cowboy Magazines.